Hello beauties!! Hope the weekend is going great for all of you. Today I am going to review a body scrub which is one of an essential product in my winter skincare stash. 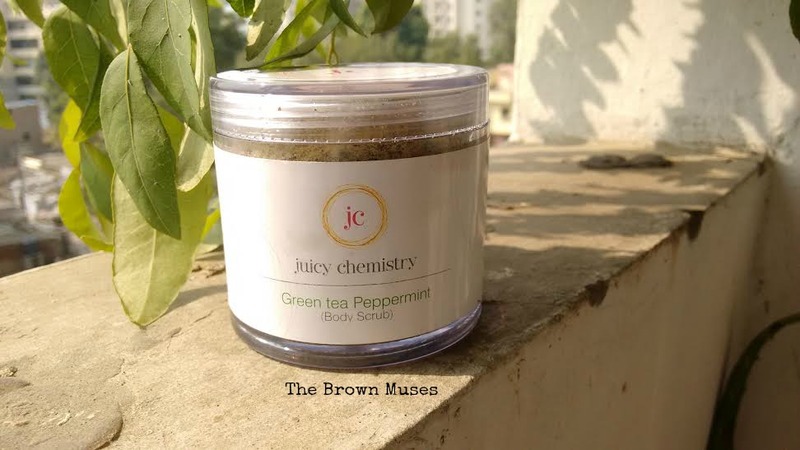 I love using body scrubs and the scrub that I am going to review is called Green Tea Peppermint Body Scrub by Juicy Chemistry. Read on to know my tryst with the scrub. Refreshing Green tea Peppermint Body Scrub that protects the skin from irritation and inflammation. The perfect body scrub for oily skin. 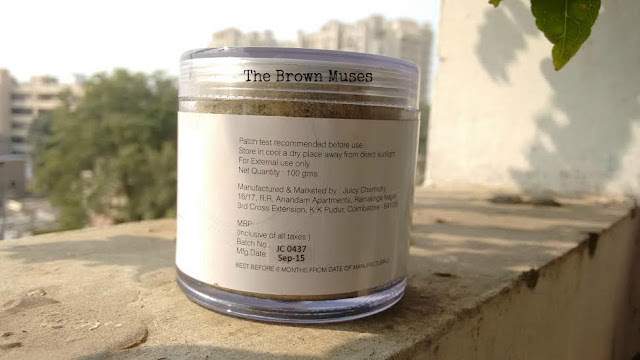 The scrub was a part of the giveaway prize that I had won alongside choco mint body butter organised by The Girly Musings blog and Juicy Chemistry. 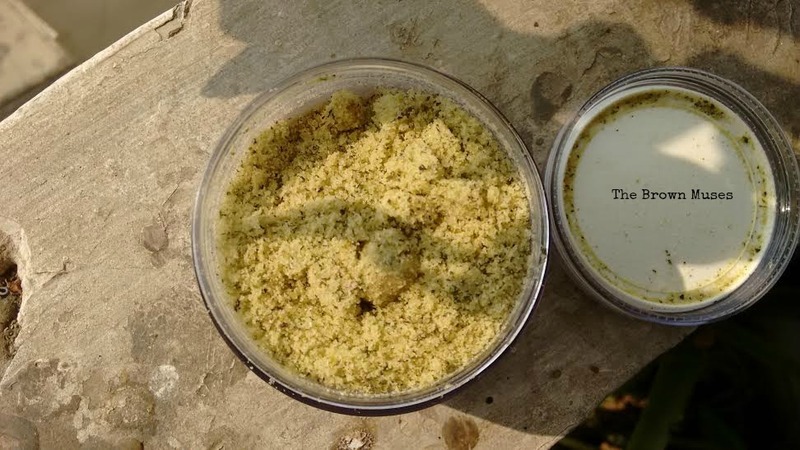 The scrub comes in a plastic jar with a transparent screw lid and an inner lid to protect the content inside further. The scrub is in gritty powder form and has an uplifting aroma with top notes of peppermint and bottom notes of green tea. It has a strong smell which may bother people with sensitive noses. The good thing is the smell doesn't linger on the skin for too long after it's washed off. The scrub green in colour due to presence of green tea leaves in it, the brand has used no artificial colour. The jar is travel friendly but make sure you don't drop it because then it might break. I use the scrub 1-2 times a week, I scoop out desired amount with a clean and dry wooden spoon provided by the brand (make sure you never use a wet spoon or fingers to scoop out the product as that will contaminate the product). I apply it on damp body and scrub it gently for 2-3 minutes, I rinse after that and it leaves my skin very soft and clean, the scrubbing granules are slightly on the abrasive side so one has to be very gentle whilst scrubbing. It may not suit people with sensitive skin. The scrub is very effective in removing dirt from deep within which is awesome, prolong use also makes the skin's texture smooth.. Even though the scrub is meant for oily skin, I have not found it drying for my dry skin since it contains olive oil and coconut oil. In fact it mildly moisturises my skin post use. I have also noticed a brightening effect on my skin. Since the scrub contains peppermint oil, it leaves a cooling effect post rinse which goes away after 5-10 minutes. This would be surely loved by those who use it in summers. 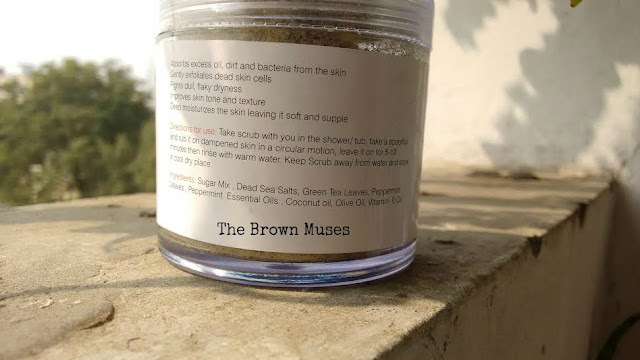 Additionally, the scrub also contains goodness of green tea leaves which are known for reducing inflammation, soothing sun burn, it also reduces signs of ageing. To conclude, I enjoy using this scrub as leaves my skin soft, smooth, clean and moisturised! Cost effective - As little quantity is required. Contains goodness of peppermint oil and green tea. Exfoliates the skin superbly. Leaves the skin soft, smooth, clean and moisturised. Smells lovely yet different due to a rare combination of peppermint oil and green tea. Availability - But I do not mind buying it online. Scrubbing granules are slightly abrasive. May not suit people with sensitive noses. Aroma may bother people with sensitive noes. Will I recommend? : Definitely! Without a doubt. Disclosure: This product was sent as a giveaway prize and the views and opinions expressed hereby are strictly unbiased, based on my personal experience.